These are available via online delivery. Additionally, all of our Punch Needle Patterns are available for online delivery as a PDF. Click on the photos to go to the pattern to learn more or purchase. Punch Needle is an old craft that lots of people have taken up these days. It is portable. A project will look like a mini hooked rug. You work it from the wrong side, creating loops on the right side. The loops can be short, medium or long, cut or left loopy. You can do it anywhere without a lot of equipment. 90 Items. Showing Items 25 thru 48. To delight any child: 21 dinosaurs running, standing, and eating. You can use your most wild fabrics because nobody really knows what colors they were! Fourteen different dogs including a basset, spaniels, shar pei, whippet, Irish setter, westie, pug, boxer, and a Jack Russell with two sizes of dog bones. Twenty different dogs. Some of the breeds included are German shepherd, poodle, bloodhound, beagle, Dalmatian, St Bernard, corgie, Chihuahua, Boston terrier, and collie. Five dolphins, including two that are jumping, and a mother with her baby. In this pattern resides five English dragons, Merlin, a griffin and a unicorn. There is also a castle, a piece of gold lame fabric to make stars and lightning. We used glass multi-faceted antique buttons (that we found at a flea market) to represent crystals that two of the dragons, the griffin, and Merlin hold. There are many 3-D details in this quilt. Eight full sized eagle drawings. You can use them individually, or in a group. This would make a great gift for someone in the military or an Eagle Scout. 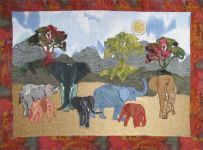 A small herd of eight elephants, each having 3-D ears and faces (using UltraSuede® or felt), a tree and a modular underbrush pattern to make up a unique scene. Instructions for making cording to use as tails are included. Twenty five exotic birds including parrots, toucan, quetzal, parakeets, cockatoo, and anhinga sitting in a tree with branches you can arrange. This pattern includes 16 drawings for machine applique with two chicks and an egg. There is also a pattern and instructions for paper piecing the triangle shapes that were used for filler blocks. The quilt pictured measures 41" x 48". Five birds that could be on any farm: Rooster, Pheasant, Peacock, Turkey and Guinea Hen. 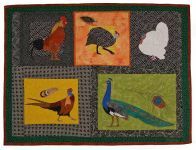 You could combine these critters to make a larger quilt with Farmyard Friends, or Fancy Fowl 1. More than 21 critters including five cows, five chickens, three pigs, two geese, two dogs, four goats, a herd of sheep, a border collie, another dog, a duck, baby chicks and duckling. This beginner pattern will teach you how to felt an applique, blend colors and make an easy bag to hold a 16 oz. water bottle. We combined 24 fish that fishermen catch and people eat. The cover quilts show the fish in Madras plaid. 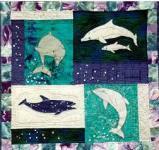 Not all 24 fish were used to make this quilt pictured which measures 37" x 47". 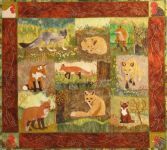 There are drawings for nine foxes and four chicken portraits, and a line drawing for the border quilting. 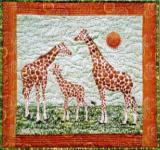 The Giraffe Family is sewn with raw edge appliqué technique: each appliqué is straight stitched around the edges. The ears and mane are 3-D. There are 14 goats in this applique pattern. The quilt in the photograph above measures 35" wide x 39" long. The goats are sewn in a combination of raw edge appliqué and satin stitch appliqué. This pattern has 15 goldfish, one channel catfish, fancy koi with many variations for coloring, and underwater plants. Directions for reeds and crushed-fabric rocks are also included. 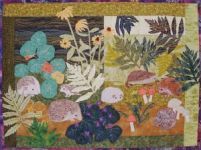 There are seven hedgehogs with 3-D ears and flowers, mushrooms and ferns in this pattern. 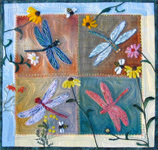 The quilt in the photograph measures 31" wide x 23" high. This is a perfect design for a gift for the hunter! There is a fabric log cabin with a door that opens, and 20 animals in this pattern, featuring a deer, antelope, buffalo, a moose, prairie dogs, fox, hare, and fish. The pattern has 24 hummingbirds with flowers and leaves for embellishment. 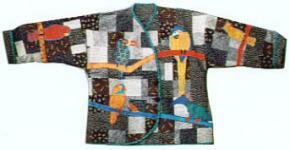 There are complete instructions on raw edge appliqué and crazy quilt piecing. The pattern has 8 hummingbirds with flowers and leaves for embellishment. There are complete instructions on raw edge appliqué and our unique block arrangement. Featuring dropped shoulders, yoke, side closings and pockets. A generous fit in sizes 10, 14, 18, & 22 with instructions for embellishing with Critters appliqués (purchased separately) and a Critter closure instead of a button.